We were a small group of volunteers, mostly first time volunteers, that went to help at our For A Day event at Nicklaus Children's Hospital. The event had a slow and steady pace, but was definitely lively and successful. 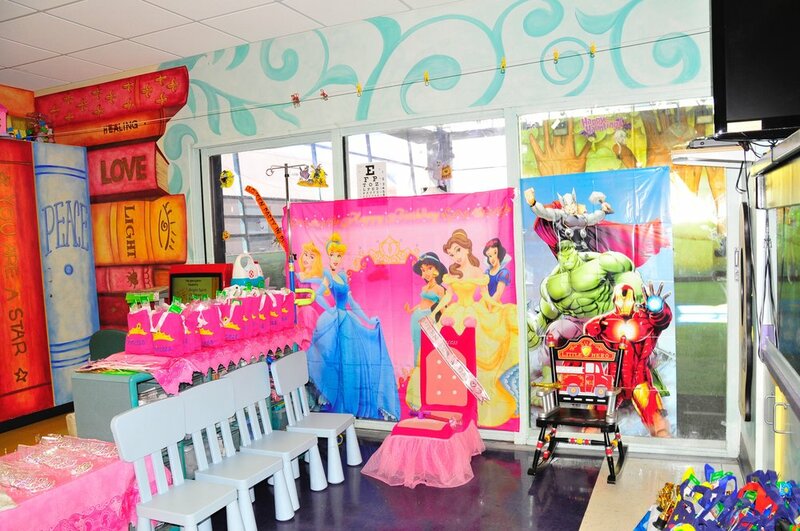 We got there early to set up the playroom. We had multiple stations for girls and boys. The girls had a sash to decorate, a picture frame craft, option of a princess necklace craft or crown. 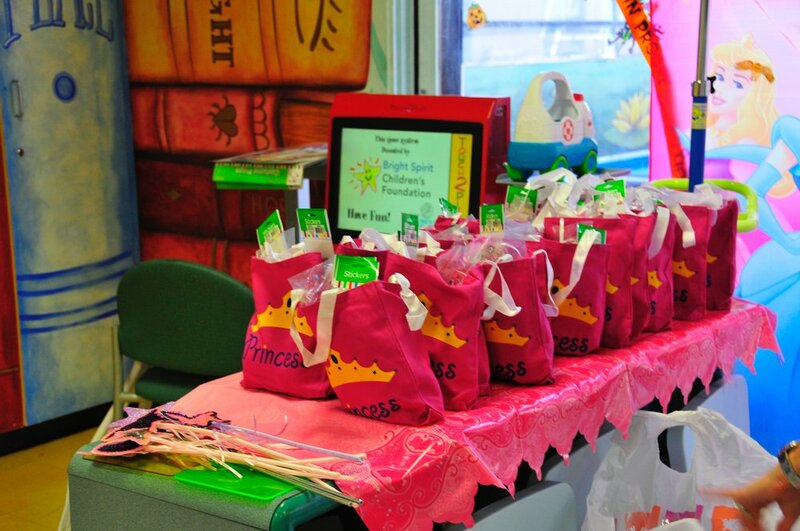 They also had a beauty station, where the girls could paint their nails and do their make up, with sample gift bags from Mary Kay. The boys also had fun crafts, they had the option of decorating a shield, a cape, or a a badge craft. We had two awesome coronation stations set up. For the girls we had a throne, with scepters and crowns, a princess backdrop, boas, and gift bags filled with goodies, jewelry and make up and bedside activities. For boys we had a Fireman coronation chair with super hero backdrop, and wonderful goodie bags filled with toys, stamps, and bedside activities. We had a really creative group, that really got into the crafts, especially the boys (see photo). We had a lot of girls, and their moms, really get into painting nails and doing their make up, you could really see the joy on their face to take their mind off their current situation of being in a hospital for long periods of time. One of my new favorite things that we now do at our events is the "Parent's Corner". We have a massage therapists doing chair massages along with coffee and donuts. It really give the parents a much needed break. You can really see the relief even a few minute break gives them, and that brings me joy. All the boys and girls loved taking their photo with the lovely Kelly Edwards, Mrs. Florida 2015. We had more room visits than usual this time. We went to 6 rooms where we did something different than our other events. We provided the children who were too ill to attend the event with a kit from "Coming up Rosies", a charity started by my friend Paula, for her daughter Rosie, who lost all her hair due to Alopecia. The kits include an 8x10 canvas, brushes, paints, that will be turned into a custom headband, or neck scarf of their masterpiece. Kelly and I went to the rooms handing out the kits, and some of the crafts, and brought the event/party to them. They were crowned bedside and it really made their day. They were able to enjoy their crafts and activities in their room and not feel like they missed out. Overall it was a huge success. The child life specialists say we are their favorite outside event as we cater to both boys and girls, and really help lift their spirits. It's so rewarding to be able to bring this to the children. As a mother, I see the value and happiness it brings to the kids, and how important it is for them, and the adults, to have a good time. It's such a welcome distraction from the very uncomfortable hospital world. Having just recently spent 4 days at Nicklaus Children's Hospital, with my 3 year old daughter, I really see the value of making kids smile in an otherwise overwhelming environment. I look forward to our next event where we can bring more smiles to children who are currently spending time at the hospital. Thank you for this organization and the ability to spread joy to those in need.